2 Songs in 35 Minuten, extrem hypnotisch mit einem Gesang, der an eine Mönchsmesse in der Gruft erinnert: sehr beeindruckend! 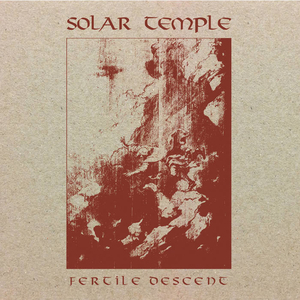 Emerging from the edge of the ancient forests of the Veluwe, Solar Temple offers their debut full length. 'Fertile Descent' lures you in with its direct yet swirling black metal impression and unique approach. Like something sinuous at the edge of your vision but not quite perceivable, the two tracks of this album twist and bend with a dizzying ferocity. Pummeling sounds entwined with a distant echo that also feels warm and inviting. 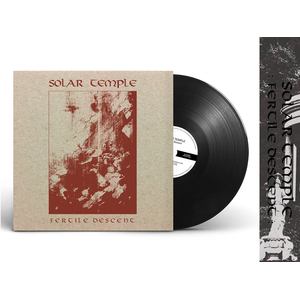 'Fertile Descent' takes the foundation laid with the 2017 demo, 'Rays of Brilliance' and expands on its reverberant nature. Subtly giving the nod to a wide variety of bands ranging from contemporary dutch black metal to Swans, it weaves a veiled path for the listener. Recorded during lent mmxvii. Mastered by greg chandler at priory recording studios.